As a civilization we are blanketing our planet with plastic. One of the most frightening illustrations of this fact is a prediction that by 2050, our oceans will contain more plastic than fish. Amazingly, a smart solution for reducing our reliance on plastic, and protecting marine life, could come from those very oceans, as well. A new material named “agar plasticity” just won the prestigious Lexus Design Award, given out as part of the annual Milan furniture fair. Designers at AMAM are using agar, a gelatinous substance derived from marine algae, to create a safe, ecological alternative to plastic. Agar is a substance you’re already very familiar with, even if you don’t know its name. It’s added to processed foods like ice cream and jelly to improve consistency, and has many scientific applications as well. Agar is made by boiling a specific type of red algae, which results in the collapse of the plant’s cellular walls. The soupy liquid is then placed into a mold and dehydrated. The designers also experimented with freezing and compressing the agar to give it different properties. The ability to morph the agar from a feathery cushion to a rigid shell is what makes it the perfect substance to replace a wide range of packaging materials, from bubble wrap to Styrofoam. Like mushrooms, another organic material which has been heralded as the future of packaging, agar can simply be composted at the end of its use. And as those who garden know, agar is actually beneficial for plants: It is used as a wetting agent to help keep soil moist, something the designers envision as an added bonus for the material’s end-life. 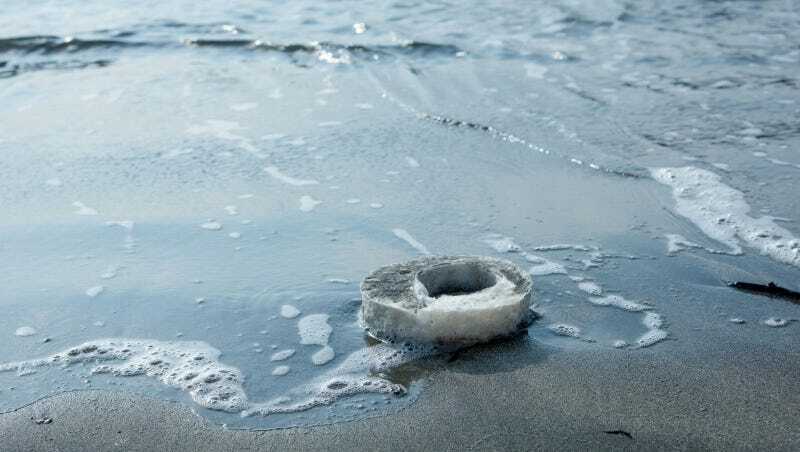 And of course, should a piece of agar plastic make its way into the ocean, it would slowly be reclaimed by the sea.